Sauced Material brings together a group of artists (Chris Bond, Ricky Emmerton, Tara Marynowsky, Daniel Mudie Cunningham and Nicola Smith) who extend the narrative or form of existing media. Their works have been shaped, moulded and crafted from film, music, personal histories and literature but with flavour anew and enhanced. Memory is at play - but so is the politics of ownership and origin. Curated by Gina Mobayed, Director, who will be joined by all five artists for a floor talk at 1pm on Saturday, 3 March, followed by the curators of See: Phaedra Photography. Kraken is the culmination of four years of research, the end-point of Bond's PhD study into dissociative practices in the visual arts. At the centre of the research and exhibition is the character Kraken… a performance artist with an antagonistic bent. Together, Kraken and Bond create uncanny scenarios in which they think, feel and act from within the mind and body of the other, generating novel narrative, fictional documentation and source material. The exhibition showcases processes and outcomes of the relationship- video, performance remnants, text and painting. For B-SIDE, BLINDSIDE will present a large scale exhibition of works for sale by our accomplished and significant alumni. Exactly half of the work in B-SIDE will be hidden. Each artwork on display in B-SIDE will be linked to a partner work (a b-side), which will be revealed only to the buyer. As a fundraising exhibition B-SIDE will support the ongoing activity of BLINDSIDE into the future. For the past 14 years BLINDSIDE has provided a vibrant space for artists to test ideas and challenge conventions. B-SIDE will facilitate BLINDSIDE's continued program of experimental exhibitions, critical and engaging public programs, as well as support arts writers, curators and artists at all stages of their careers. BMCAA recipient Chris Bond presents Congress, a multi-disciplinary work in which he operates under the guise of alter Louise Bryce, to recreate, perform and document Bryce’s imagined performance and sculptural practices. After a meeting earlier this year at the State Library of Victoria with the historian Judith Weeks, Bond claims to have come into possession of an old ledger book said to have been used as a sketchbook by Bryce, who briefly hired the upstairs room at Temperance Hall as a studio space in 1975. According to Bond’s narrative, Bryce used the room to develop a private performance practice, which she planned in detail in the book, titled Congress on the cover. The book contains pages of drawn plans for timber and fabric sculptural forms that Bryce envisaged installing throughout the upstairs area at Temperance Hall, and included notations on how they might be interacted with through performance – none of which, according to Weeks’s research, ever materialised. Bond gives shape to Bryce’s ideas by carefully reconstructing her designs, paying close attention to scale, material, and position in space, while attempting to recreate the relationship of the performer’s body to the object through photographic documentation. Congress plays with the legitimacy of documentation, questioning its role in performance practices, engaging with the politics of interpretive reconstruction and the awkward position of fiction in contemporary art. acknowledge the power of books through art. Established in 2016, the $10,000 invitation-only BalletLab McMahon Contemporary Art Award (BMCAA) is awarded each year to a contemporary artist who demonstrates a commitment to brave and innovative practice that contests and re-imagines the boundaries of contemporary art in new and significant ways. The BMCAA provides a valuable opportunity for one outstanding Victorian artist to progress their practice through the creation of a new work inspired by and exhibited at South Melbourne’s Temperance Hall, home of Philip Adams BalletLab (PABL). Max Delaney, Director of the Australian Centre for Contemporary Art was the inaugural BMCAA Judge and selected Chris Bond from a shortlist of five Victorian artists. The 2017 BMCAA shortlist panel included Serena Bentley (Assistant Curator, Australian Centre for the Moving Image), Michael Brennan (Independent curator and Artist), Hannah Mathews (Curator, Monash University Museum of Art), Patrice Sharkey (Director, Westspace) and PABL Artistic Director, Phillip Adams with philanthropist, Dr Marcus McMahon who share a committee seat. Chris Bond will present his winning work 'Congress' at Temperance Hall in August 2017. Taking its cue from Ways of Seeing (1972), John Berger’s critical text on visual culture, this group exhibition explores the various formalistic strategies that artists employ to re-configure our perception of the world. Curated by Sam Bardaouil and Till Fellrath of Art Reoriented, the exhibition posits the surface of the artwork as a space of encounter between the internal aesthetic deliberations of the artist’s creative process and the external often-conditioned gaze of the viewer. Ways of Seeing presents contemporary paintings, photographs, sculptures and videos, alongside artworks that span several centuries by artists such as Ghada Amer, Salvador Dali, Andreas Gursky, Mona Hatoum, Grayson Perry, Cindy Sherman and James Turrell. It unfolds along a non-linear temporal thread whereby the viewer’s desire to 'understand through seeing' is constantly challenged through artworks that refuse to operate along the rigidity of styles, genres, and so-called 'isms'. In doing so, we are reminded that 'the relation between what we see and what we know is never settled'. It is in this inherently political process of searching, that we begin to discover several ways of seeing... The exhibition is accompanied by a fully illustrated 200 page, bilingual Turkish / English publication. It is co-edited by Sam Bardaouil, Süreyyya Evren, and Till Fellrath. With contributions by Mary Acton, Sam Bardaouil and Till Fellrath, and Stephanie Moser. Artists: Colleen Ahern, Peter Atkins, Louise Blyton, Chris Bond and Drew Pettifer, Michael Brennan, Yvette Coppersmith, Craig Easton, Juan Ford, Julia Gorman, Stephen Haley, Irene Hanenbergh, David Hawley, PJ Hickman, Sam Leach, Tony Lloyd, Rob McHaffie, Jan Murray, Lynette Smith, Bryan Spier, Darren Wardle. A small show of imperfect paintings is a modest gathering of failed paintings by twenty one accomplished artists. Imperfection in a painting emerges from the uncertain condition of its making and reception. Paintings are hard to begin, difficult to stop and defy easy objective evaluation, and the unease generated by the absence of clarity during each stage can quickly spill into an overwhelming feeling of not-quite-rightness. That feeling is the result of an acute awareness of the distance between the artist’s intention and the work’s material actuality, but it is not a feeling that necessarily needs to be reconciled, for once the painting has been designated as imperfect, it finds itself liberated from all of the things that it should be doing into something that simply exists by - and for - itself. Imperfection, let alone failure, is of no value in the contemporary economy of the unblemished and the functional. A small show of imperfect paintings provides the lightest of counterweights to this bias, opening a forum for a reconsideration of what might seem unreasonable: the idea of a kind of freedom, or maybe even perfection, in failure. Chris Bond is showing a suite of new drawings at Carriageworks made in collaboration with the character Wes Thorne. Also showing at Carriageworks: Richard Bell Karla Dickens; Atlanta Eke & Ghenoa Gela; Heath Franco; Alex Gawronski; Agatha Gothe-Snape; Alan Griffiths; Jess Johnson & Simon Ward; Richard Lewer; Archie Moore; Claudia Nicholson; Ramesh Mario Nithiyendran; Justene Williams; Jemima Wyman. "This installation is a collaboration between Chris Bond and an identity named Wes Thorne, who Bond claims is actually himself. 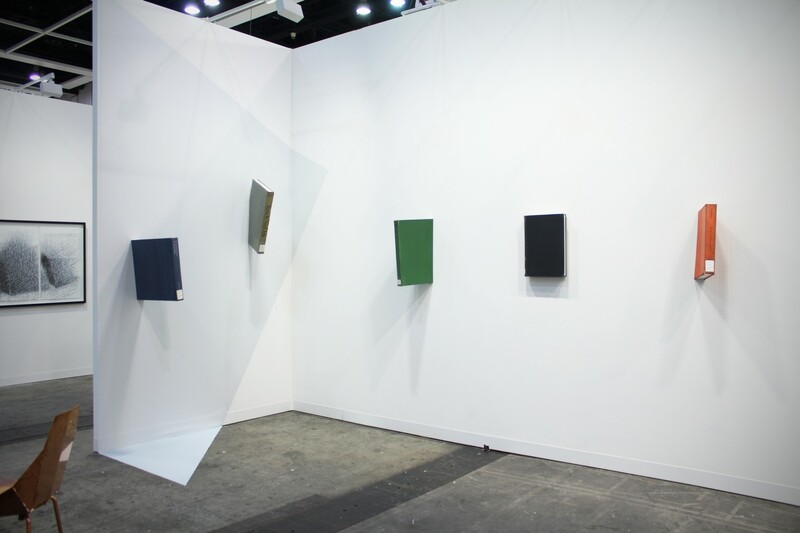 The installation comprises several pairs of thin paperbacks, related to ways of seeing, to portals, openings and networks. Bond and Thorne have subverted these forms by either adding scratched patterns or automatic scribbles to their covers. The experience of these book pairs is quite magical for the viewer – while they were created in collaboration with a pseudonym, the objects make subconscious artistic commentaries on the sciences of perception, relativity and psychology. For the pair titled In Praise of Shadows (2016) the covers have the appearance of grids of micro-lenses from a light-field camera. After their transformation, they could also be read as large-scale astrological lenses. 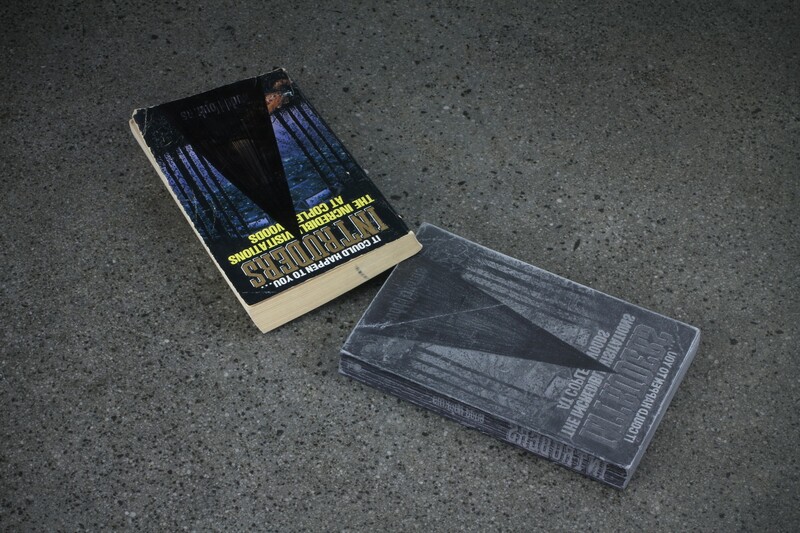 Scratched into the front of these books is a globular cluster of stars, and to the side of the grid there is a meteorite depicted travelling at a great speed. On closer viewing, we can see the cluster’s middle has been scratched with such intensity that a hole has been created. Such imagery conjures in the viewer thoughts of black holes and parallel universes of space and time. It is as though Wes Thorne is making an artistic adjustment to the sciences of time and perception with what he perceives to be true or complete. The second book in each pair is a mirrored facsimile that is drawn with graphite pencil and read from left to right. The fact that Bond has created these in partnership with Thorne comments on how the self is a fluid construct made up of our past experiences, and brings to light ideas of coincidence and intersubjectivity. For the pair titled Mondrian (2016) we see a thick black automatic-marker scribble on the cover of a book about modernist artist Piet Mondrian, who used a uniform and colourful technique of abstraction, drawing the viewer’s sight to a series of highly ordered opposites. The scribble adds an unmediated element of mayhem to Mondrian’s abstract painting beneath. For the facsimile of this pair, the Mondrian is drawn in greys so that the black scribble dominates. All that is left of Mondrian’s original work is a shadowy in-between area, a space of oblivion. 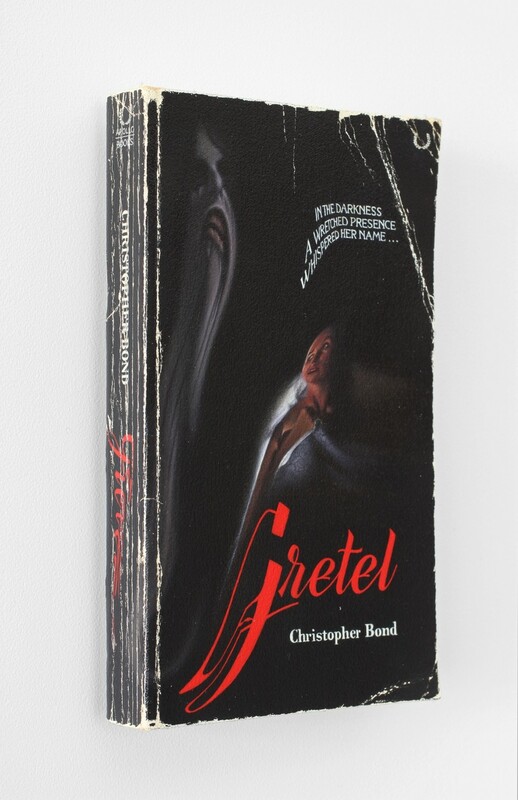 Bond includes similar techniques of adjustment to the book covers throughout the entire installation, but in different tones of black and grey that continue this sense of oblivion for us. In contemplating this scene, the viewer sees a reconciliation of the oppositional forms that exist within Mondrian’s compositions. From here the audience can perceive an end, a place where our sense of human order is subsequently destroyed, leaving room for transcendence as well as a corruption of human pattern." Chris Bond is a finalist in the 2016 Archibald Prize, Art Gallery of New South Wales, with his self portrait 'The Restless Dead (portrait of the artist)', 2016. For Art Basel Hong Kong, Chris Bond has produced a new body of sculptural paintings that draw on the energy of his long-standing alter-ego Tor Rasmussen. 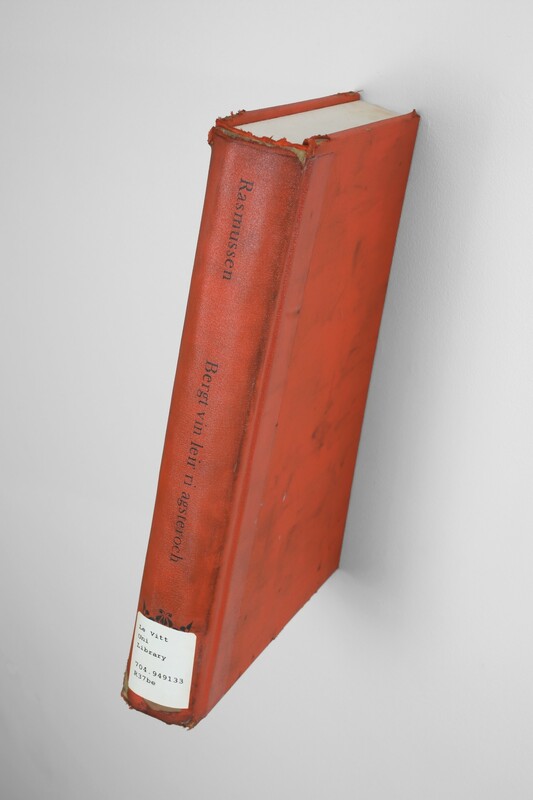 Part monochrome painting, part trompe l’oeil sculpture, the spines of these facsimiles of tattered hard-back library books contain titles generated by their apparent author Rasmussen. They have been made uncannily large, too big for the shelves of any library, impossible to hold or read, and contain meticulously replicated signs of wear and tear, hand painted text and library call numbers. Each work reveals Bond’s fascination with perverting existing systems of meaning, creating his own library, and within it, a new language. The colours and subject matter used in the paintings by these artists are undeniably ‘of our time’, yet they suggest a diversity of art historical and cultural references. In doing so they maintain a connection with the art of the past, notably Modernism and contemporary art in Europe, America and Australia. The colours used are not identical to those referenced, there is a colour shift. A major exhibition of documentary and pseudo-documentary forms related to Chris Bond's character Tor Rasmussen. In late 2014 Bond invented a Norwegian artist by the name of Tor Rasmussen (also known as Kraken), who stayed at his house for a six week domestic residency, as part of a larger international program. During this time he caused significant upheaval - threatening, annoying, tormenting, disabling and frustrating. Bond plays Kraken, as well as himself, in documentary photographs, video, text and sculptural forms that attempt to dissolve and expand the self. Primary motivation for assuming an alter persona rests in the possibility of imagining new ways of being, acting and making. Given the rapid developments in the way we communicate, it is timely to consider the role of text in art. Muriel McGivern was both a published author and practicing artist, so it’s apt that the 2016 R & M McGivern Prize should harness the power of the painted word. 'A Stranger in the Mirror' takes its title from a painted book made by the artist for the 2016 Adelaide Biennial of Australian Art. A selection of works from that exhibition, alongside two new painted books form his second solo show at Darren Knight Gallery. Each work has been made under the guise of his muse and master, the invented Norwegian Tor Rasmussen. Three painted library books, each authored by Rasmussen, feature titles and imagery that Bond has created while in character. They contain invented publishers, ISBN and call numbers, and have apparently been borrowed from the collection of the Le Vitt College Library. These three painted books appear to be embedded into the wall. Other painted books offer narrative support: charting the burning and rebuilding of the Le Vitt library, referencing the power of the invented call number seen on the embedded library books, and three painted paperback novels, including 'A Stranger in the Mirror' that romanticise the perversity of the process under which the works were made. Material is an exhibition of paintings featuring four invented artists and an artist collective, profiled in the 2002 edition of the fictional visual art and performance magazine ‘material’. The closely worked paintings, each seemingly torn from the pages of the magazine, explore the potential of embodied characterisations to foster new ways of seeing, thinking and expression. Although the characters Catherine Crouch, Martin Meeks, Arlo Alston, Rebecca Rodrigues and the Magic Mountain Art Collective are entirely imagined, they have a tangible presence in the mind of the artist. Each of the characters began with the invention of a name, around which a small world gradually grew. The names spawned imagined biographies, which assisted Bond in figuring out how they might interact with the world, and in turn suggested the kind of artistic practices they may be involved in, which he acts out in the works. The focus of this particular issue of material magazine is, fittingly, on acts of transformation. 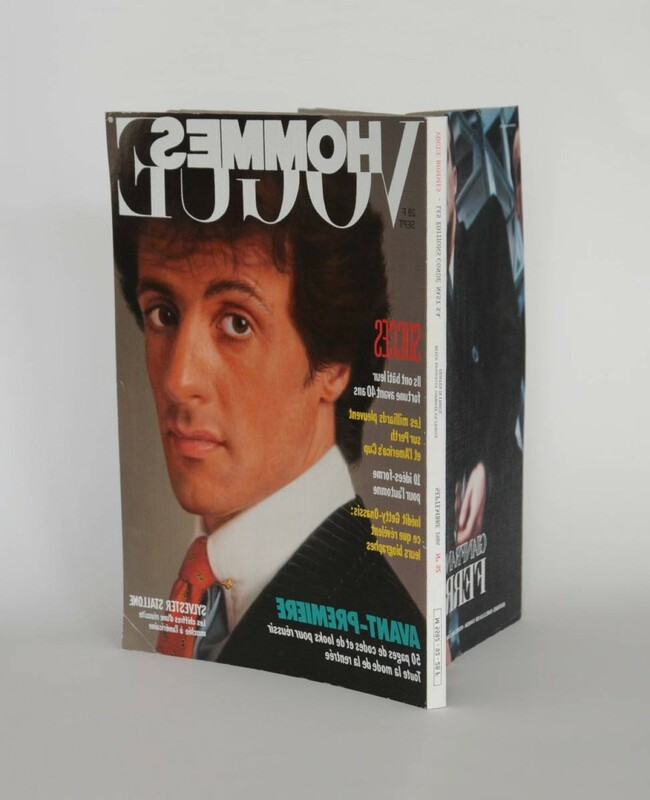 Bond has literally inhabited each of his characters: he has photographed himself working as them, written quotes on their behalf, and edited these into a plausible magazine profile format. He remains present in most of the works, almost identifiable in some, but changed - sometimes cropped, sometimes blurred, sometimes disfigured, and sometimes missing altogether. Although his characters remain somewhat like him - sharing particular traits, exaggerating others - they perform actions at a remove from his ordinary existence, allowing him to reach out to the world in unexpected ways. The SPRING 1883 art fair is back at the Windsor Hotel, Melbourne from August 18-21. Darren Knight Gallery will be presenting a group exhibition by gallery artists Chris Bond, Jon Campbell, Matlok Griffiths, Mark Hilton, Jess Johnson, Noel McKenna, James Morrison, Michelle Nikou, Kenzee Patterson, Ricky Swallow, John Ward Knox and Louise Weaver in Room 224. Taking its name from the Latin meaning ‘the essence of a thing’, Quiddity (1 July – 20 August) explores the idea of thinking about artworks as physical objects rather than seeing them as items invested with meaning or expressing emotion. Drawn entirely from the RMIT University Art Collection, the exhibition will display new acquisitions alongside some of the University’s older treasures which have remained largely unseen for decades. Quiddity features a diverse range of artists including Chris Bond, Helga Groves, Hisaharu Motoda, Anthony Pryor, Klaus Rinke, Ah Xian, and Ken and Julia Yonetani. CLIMARTE has commissioned eleven artists to design posters that engage the community on climate change action and convey the strength, optimism and urgency we need to move to a clean renewable energy future. During April-May hundreds of AO posters will be printed and displayed on poster sites around Melbourne. Titled Magic Object, the 2016 Adelaide Biennial of Australia Art takes inspiration from the Wunderkammer, delving into a world of wonder and enchantment through the eyes of Australian contemporary artists. Magic Object will offer a space where free associations and insights are made possible by artists and audiences, where artists’ interests in the talismanic, in cultural rituals and material riddles enchant the viewer. This enchantment however, is not without caution – the Wunderkammer offers itself up as tool with which to not only view the world, but to critique it. Inviting us into their own ‘cabinets of curiosity’ through photography, painting, performance, sculpture, installation and the moving image, will be artists Abdul-Rahman Abdullah (WA), Glenn Barkley (NSW), Chris Bond (VIC), Pepai Carroll (SA), Tarryn Gill (WA), Louise Haselton (SA), Juz Kitson (NSW), Loongkoonan (WA), Fiona McMonagle (VIC), Danie Mellor (NSW), Clare Milledge (NSW), Tom Moore (SA), Nell (NSW), Ramesh Mario-Nithiyendran (NSW), Bluey Roberts (SA), Gareth Sansom (VIC), Robyn Stacey (NSW), Garry Stewart & Australian Dance Theatre (SA), Jacqui Stockdale (VIC), Heather B Swann (ACT), Hiromi Tango (NSW), Roy Wiggan (WA), Tiger Yaltangi (SA) and Michael Zavros (QLD). Presented by the Art Gallery of South Australia and curated by Lisa Slade, Assistant Director, Artistic Programs at the Art Gallery, Magic Object runs from 27 February to 15 May 2016 as part of the Adelaide Festival of Arts. Chris Bond has made a new sequence of paintings and documents under the guise of his muse and master Tor Rasmussen. Five painted library books, each authored by Rasmussen, feature titles and imagery that Bond has created while in character. They contain invented publishers, ISBN and call numbers, and have apparently been borrowed from the collection of the Le Vitt College Library. These five painted books appear to be embedded into the wall. An email from Rasmussen to Bond is also included, in which he chastises Bond for his fictions. A burnt book from the ruins of the Le Vitt library is sent by Rasmussen in the mail as a reminder of the power of the real. Three painted books offer narrative support: charting the burning and rebuilding of the Le Vitt library, referencing the power of the invented call number seen on the embedded library books, and romanticising the perversity of the process under which the works were made. In late 2014 Bond invented a Norwegian artist named Tor Rasmussen (also known as Kraken), who came to stay at his house for a six week domestic residency. During this time he caused significant upheaval, documented through photography, video, and textual correspondence. Bond plays Kraken, the residency program manager Julie Redfern, as well as a version of himself, simultaneously dissolving and expanding the self. Primary motivation for assuming these personae lies in the possibility of using channelled, imagined forces to break self-conditioned responses to ideas and materials, and imagine new ways of being, acting and making. After the success of the inaugural SPRING 1883 art fair in Melbourne last year, SPRING 1883 is back, this time in Sydney. From September 9-12 SPRING 1883 will take over the entire Establishment Hotel, in the heart of Sydney’s CBD. The Establishment is a luxury, boutique hotel, providing an accessible and opulent environment for art lovers. It also contains numerous bars and restaurants, to make a visit to the fair an experience to remember. SPRING 1883 will see 24 galleries presenting the very best contemporary art from the region across four levels of the hotel. This exhibition, opening on 25 September, explores text and fictional storytelling as an art and exhibition making strategy.